I had about 1-1/2 pounds of turkey tenderloins in the fridge that I knew I could quickly season and sauté but I had trouble figuring out how I wanted it to taste. See, when I think of turkey breast that isn’t of the deli slice variety, I think of Thanksgiving. I didn’t want to take the time it would take to bake it and I certainly didn’t want to take the chance of drying it out if I did throw it in the oven. Yes, I know I could’ve brined or marinated it and bake it covered, on 400 for 25-30 minutes, but you know me… AintNobodyGotTIMEForAllThat! I stumbled upon a recipe on one of my happy websites, Williams-Sonoma! You can find the original recipe here. I didn’t have everything listed in the ingredients, (specifically the fresh thyme, sage, marjoram and Madeira/sherry), but I knew if I seasoned it well enough with what I did have, I’d still have a perfectly yummy dish! Now, I know gravy isn’t conducive to my weight loss efforts, but that’s why I only used a couple of teaspoons of it when I partook of the meal. Nothing wrong with a little “sauce”, especially when you are in control of what goes in it. (BUT, don’t listen to me if you’re trying to lose weight. I tend to cheat here and there and I know it hinders my progress. There is quite a bit of saturated fat because of the butter, so you can always use less of it or replace it with olive oil.) This recipe yielded way more gravy than what is necessary, so I ended up freezing it for future use. I figured if I chose to make this simple dish again (which you can bet I will), I’d be able to skip the last part of the recipe and get to eating! See what I did below. As always, I apologize for not having exact measurements for the dried herbs and spices I did use, but y’all know how I do! I season and cook based on smell. It’s just what I do! 2. In a large fry pan over medium-high heat, heat the olive oil. Add the turkey in a single layer and cook, turning once, until golden on the outside and opaque throughout, approximately 4 to 6 minutes total depending on the thickness of your cutlets. I had to cook my cutlets in batches. Transfer to a plate. 3. Now for the best part… the gravy!!! This is what made it taste like Thanksgiving! Add the butter to the pan and reduce the heat to medium. When the butter is melted, add the celery and onion and sauté until softened, about 3 to 4 minutes. Stir in the flour and cook, stirring constantly, until the mixture is thickened, about 1 to 2 minutes. Slowly stir in the broth and water. Cook, stirring constantly, until the gravy is smooth, thickened, and bubbly, 3 to 4 minutes. 4.Return the turkey and any juices from the plate to the pan and simmer until heated through, about 1 minute. Serve immediately. Remove the turkey from the pan and drizzle a couple of teaspoons of gravy on them, if desired. Serves 4-5 people, depending on serving size. As you can see, I served mine with brown rice and sauteed haricot verts. But, as you can imagine, this would work well with mashed potatoes and any veggie combination. And there would be more than enough gravy for the potatoes! Enjoy! 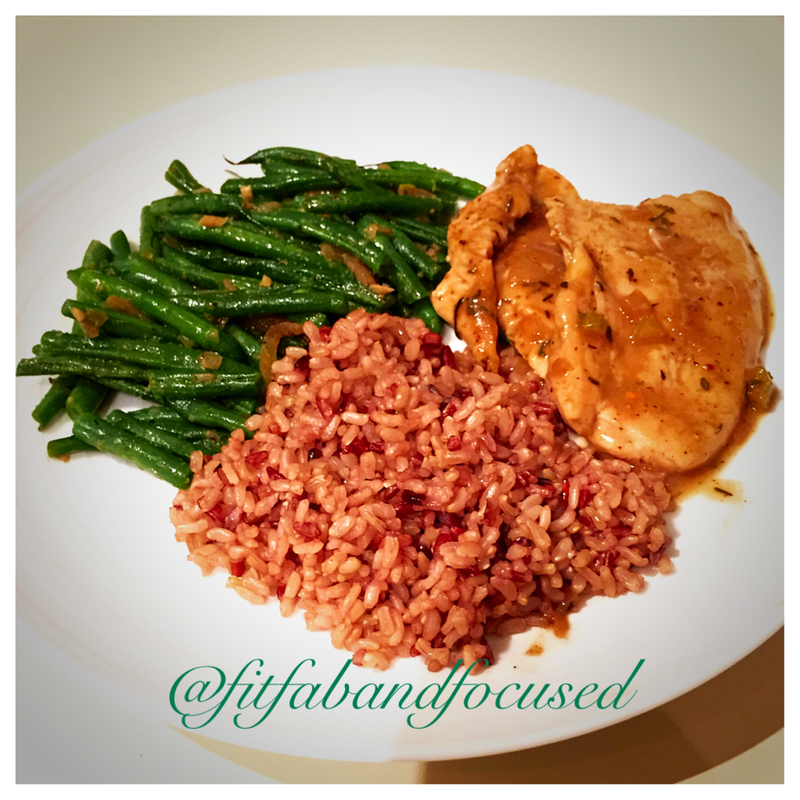 And if you decide to recreate this dish, please don’t forget to give me a shout out or hashtag it #fitfabandfocused on Instagram! Next (Not so) Ready for a RUN!!! I love using turkey cutlets. Its the only way I eat turkey outside of thanksgiving! Thanks for linking up today! Thanks for the invitation, K! I love the concept and I was able to click and follow a number of pages due to your link up! If definitely participate again! Thanks for the invitation, K! I love the concept and I was able to click and follow a number of pages due to your link up! I’d definitely participate again!